The blue-haired pop star is coming back to North America this September with a special launch edition of her next game. 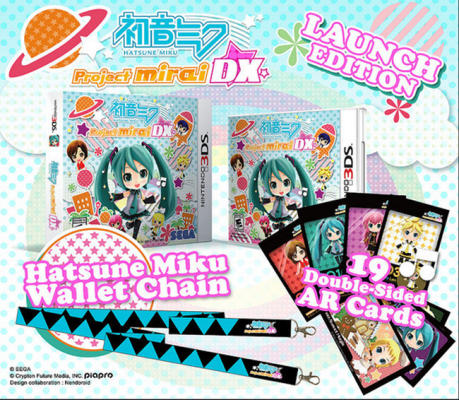 Included in the special edition of Hatsune Miku: Project Mirai DX are a few goodies that even the most closeted Hatsune Miku fans will proudly show off. The game comes within a premium outer box packaging and inside is a 3-foot long wallet chain designed to look like Hatsune Miku’s iconic belt. All copies of the game will include 19 double-sided augmented reality (AR) cards that show off additional dance moves and costumes. The 3DS game will launch in North America on September 8 for $39.99 with the special edition will be available in retail stores nationwide.